Master switch: The RAS intracellular signaling pathway regulates the expression of a number of autism-linked genes. There are many challenges facing investigators who work on autism, not least the multifaceted nature of the disorder. Geneticists, molecular and cognitive neuroscientists and epidemiologists make interesting observations on a regular basis, but most of the time these observations cannot be woven into a hypothesis that has the kind of explanatory power for which we all hope. To some extent this is not surprising: Autism is a complex, heterogeneous disorder. But the core phenotype, which can be recognized to some degree in any individual on the autism spectrum, nonetheless suggests that there must be some common underpinnings. Here I will focus on one potential unifying hypothesis: Dysregulation of the RAS signaling pathway is a significant risk factor for idiopathic, or non-syndromic, autism in some proportion of cases. This is not an altogether new hypothesis, as several researchers have discussed the convergent evidence implicating this intracellular pathway — which plays a role in promoting both cell development and cell death — in autism1. In the past two years, however, several new findings have strengthened the evidence for it considerably. Receptor tyrosine kinases, enzymes that transmit signals from neighboring cells, typically trigger RAS activity. 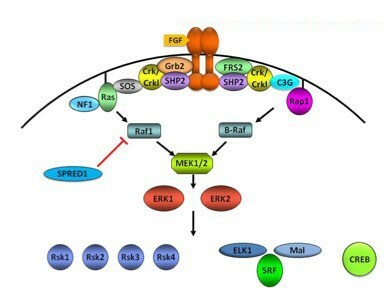 This in turn promotes a cascade of events leading to activation of one or more isoforms of the RAF kinase, followed by activation of the MEK and ERK kinases and, ultimately, the expression of target genes. Of course this ‘linear’ pathway is embedded in a network of other pathways, including well-studied enzymes such as PI3K and mTOR. As such, alterations in the activity of this broader network can significantly affect the output of the ‘canonical,’ or standard, RAS pathway. Mutations in at least a few genes in the network underlie syndromic forms of autism, and provided perhaps the first suggestive evidence that the RAS pathway might have a key role in autism. Three of the disorders most frequently accompanied by a diagnosis of autism are fragile X syndrome, tuberous sclerosis and Smith-Lemli-Opitz syndrome. In each case, the mutant proteins that underlie the disorder have biochemical links to the RAS pathway. There are other mutations that increase the risk of autism and have potentially strong links to the RAS pathway. For example, three of the copy number variants (CNVs) that predispose people to autism — deletions at 16p11.2 and duplications at 7q11.23 and 22q11.2 — all harbor genes that, at least in part, influence RAS-dependent signaling. Several teams have shown that MVP, located in the 16p11.2 region, can act as a negative regulator of ERK activity2. The canonical deletion at 16p11.2 includes 27 genes but, interestingly, a sub-deletion at 16p11.2 that spans only five genes, one of which is MVP3, was recently reported in a Belgian family whose members have autism. The 22q11.2 CNV contains three relevant genes, including CRKL, a key molecule in the RAS pathway. The other two are FGF8, and a gene that regulates it, TBX1. There is abundant evidence that members of the FGF family are the key growth factors triggering the RAS pathway in the developing brain. Finally, both human and mouse studies implicate the transcription factor GTF2I as a critical driver of the social behavioral phenotype that accompanies deletion of 7q11.23. Although our understanding of the function of GTF2I (also known as TFII-I) is limited, there is evidence that its activity depends in part on direct interaction with ERK. Evidence implicating RAS signaling in autism comes both from the functional studies of individual genes and from comparisons between autism and syndromes known to be caused by hyperactivation of the RAS pathway — the so-called RASopathies. 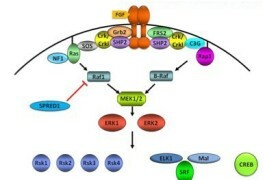 An impressive series of discoveries over the past decade has shown that this group of related developmental disorders is characterized by mutations in different genes in the RAS pathway, each of which results in a gain-of-function of ERK signaling. In their review of these disorders, Gary Landreth and his colleagues note that the constellation of phenotypes associated with 16p11.2 deletion — defects in the central nervous system, brain and heart, along with facial dysmorphology — is also observed in the RASopathies, including DiGeorge syndrome, which is caused by deletion of the 22q11.2 chromosomal region4. If deletion of 16p11.2 results in a RASopathy, then one would predict the classical RASopathies to exhibit a higher susceptibility to autism. Although the cognitive profile of RASopathies has not been well studied, some evidence suggests they are in fact marked by a substantially higher prevalence of autism than that observed in the general population. 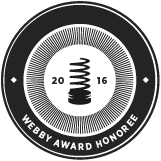 Last year, SFARI investigator Lauren Weiss won an NIH Director’s New Innovator Award to explore this question, as well as the possible role of the RAS pathway in idiopathic autism. Her preliminary data indicate that approximately 40 percent of individuals with classical RASopathies show significant traits of autism. If this result holds up, it would add significant weight to the idea that RAS/ERK hyperactivation is a strong risk factor for autism. The next obvious question is whether increased RAS/ERK signaling can explain any aspects of autism-associated neuropathology. One of the more highly replicated findings in the autism literature in this regard is that of macrocephaly, or larger head circumference, in early life in about 20 percent of children with autism. Eric Courchesne and his colleagues have reported that this increase is associated with a dramatic increase in neuron number in the prefrontal cortex5. The researchers suggest that this early brain overgrowth could disrupt the organization and connectivity of the cortex, and alter the balance of excitatory and inhibitory signals in the brain. It’s not much of a leap from these observations to excessive RAS signaling. As summarized by Flora Vaccarino and her colleagues, manipulations that affect FGF signaling in the developing mouse brain have a predictable effect on the number of cortical neurons produced6. To cite just one example, overexpression of a mutant version of a particular FGF receptor that inhibits FGF signaling results in a smaller population of cortical neurons. Given that the regions of FGF signaling and ERK activation tend to coincide in the developing embryo, it’s reasonable to infer that altered ERK activation would also be associated with an alteration in the number of cortical neurons. Support for this inference comes from the fact that, for example, the 16p11.2 deletion is associated with macrocephaly, and deletions at 22q11.2 that remove the ERK2 gene result in microcephaly, or small head size. Do the effects of hyperactive RAS signaling extend beyond brain development to autism-linked behaviors? Some data from mouse models of autism speak to this question. Inbred BTBR mice are an accepted model for autism, displaying differences in social interactions, ultrasonic vocalization and repetitive self-grooming behaviors. Xiaohong Li and her colleagues reported that, compared with B6 mice, BTBR mice have higher expression of RAS in the frontal cortex and cerebellum, and increased phosphorylation of all three isoforms of RAF and a higher activity of MEK and ERK in the frontal cortex7. William Atchley’s team has generated another mouse strain that is relevant to the early brain overgrowth seen in autism. Over 35 generations, his team selected mice for higher early body weight, followed by brother-sister matings to generate fully inbred lines that show this growth trajectory. One of these lines, A12, has more cells in the brain compared with controls. Hongxin Dong and her colleagues showed that, compared with controls, these mice have higher cell proliferation in the frontal cortex and hippocampus, higher levels of FGF2 in the frontal cortex, fewer social interactions and more stereotyped behaviors8. Once again, there is a correlation between FGF levels and cell numbers in the brain, and a behavioral profile that is relevant to autism. Finally, perhaps the most important question is whether individuals with autism show higher expression or activities of components of the RAS pathway. Based on preliminary evidence from Li and her colleagues on a small number of postmortem autism brain samples, the answer is yes. The researchers found higher expression of RAS, more phosphorylation of c-RAF, a version of RAF, and increased expression and activity of ERK1 and ERK2 in the frontal cortex of individuals with autism, compared with controls9. Much more needs to be done to confirm and extend these results, but they are consistent with the notion that RAS/ERK signaling has a role in idiopathic autism. As to where and how this increased signaling might originate, we have one tantalizing clue. There is convincing evidence that, as men age, their risk of fathering a child with autism increases. Remarkably, all of the best-documented disorders — including two of the classical RASopathies, Noonan and Costello syndromes — whose prevalence is affected by paternal age are caused by mutations that increase the activity either of FGF receptors or of members of the RAS pathway. In a series of fascinating papers, recently summarized in a comprehensive review, Anne Goriely, Andrew Wilkie and their colleagues have shown that this association is not due to hotspots of mutations specifically in RAS pathway genes10. Rather, it results from a selective advantage conferred on proliferating spermatogonia (precursors to mature spermatozoa) by mutations in this pathway, which occur at a normal frequency10. Mutations that promote RAS-dependent signaling also boost the proliferation of spermatogonia, resulting in an enrichment of sperm carrying the mutations and making it more likely that the mutations will be passed to the next generation. Based on their data, the researchers suggest that the most severe mutations — including variants in FGFR3 and HRAS — lead to the formation of testicular tumors called spermatocytic seminomas. These mutations cause lethal phenotypes when transmitted. Moderately activating mutations are associated with classical RASopathies and other disorders known to have a paternal age effect. Finally, the researchers suggest that weaker mutations could confer a smaller but significant selective advantage that would be passed to the next generation and result in a higher risk of neurocognitive disorders and cancer. It’s worth noting that one preliminary study published in 2010 associated autism with a greater risk of breast cancer11, which, perhaps not coincidentally, has also been associated with common germ line variants in the RAS pathway. What’s more, elevated RAS signaling in the germline might also help to explain another recent observation — that boys with autism have early generalized overgrowth, including increased height and weight, compared with controls12. As suggested by Goriely and Wilkie, the alignment of a signaling pathway with increased male germ cell proliferation raises the possibility that there is a constant selective pressure in spermatogonia for hyperactive RAS/ERK signaling. The effects of this hyperactive signaling on the developing brain in the next generation might set up a relatively common predisposition to autism. Courchesne has speculated that in most individuals this predisposition might not manifest as autism, owing to the relative plasticity of the developing brain13. In individuals who also carry a highly penetrant mutation in one of the many synaptic genes that have been implicated in autism, however, the usual compensatory processes might be prevented. In her NIH Innovator Award, Weiss proposes to search specifically for genetic interactions between variants in the RAS pathway and those in other known autism risk genes. RAS signaling has a central role in a whole range of biological processes, many of which could not be covered in this short review. For example, we know that the RAS pathway is a critical effector of excitatory signaling triggered by glutamate, and thus has a direct influence on synaptic function that must be accounted for in any overarching model. That said, the ideas here provide a reasonable place to start, and offer a number of clearly testable hypotheses. Several of the highly penetrant or Mendelian mutations that strongly increase the risk of syndromic autism might do so, at least in part, because they affect RAS signaling. In the broader population, selective pressure driving the transmission of germ line alterations in RAS signaling to the next generation might turn out to have important effects on the developing brain, with potential consequences for autism susceptibility that seem well worth exploring. Alan Packer is a senior scientist at the Simons Foundation Autism research Initiative. There is no causal mechanism that is predictive of autism. Most cases are likely to involve multiple risk factors of small effect (genetic and environmental) that in aggregate increases total risk. Given the huge number of risk factors of small effect many theorists seize upon one risk factor and attempt to build a unifying theory that would explain most or all cases. The evidence rather outstrips the claims. One can observe in DiGeorge (22q11 deletion) syndrome how a theorist can seize upon one risk factor to the exclusion of other risk factors of small effect and build a unifying theory that would explain all or most cases of autism. The 22q11.2 region harbors the broad autism phenotype related COMT gene which is associated in general population studies with self-reported schizotypal personality in healthy males, anxiety related traits, OCD and panic disorder without the 22q11.2 deletion syndrome. In 22q11.2 deletion syndrome, 93% of cases are the consequence of a de novo egg or sperm mutation in contrast to being an inherited event. Seventy-seven per cent of individuals have an immune deficiency including auto-immune disease regardless of clinical presentation. Independent of the COMT gene, Meechan et al’s data suggested that there are sub-sets of genes within the 22q11.2 region that influence cell cycle or mitochondrial function in the developing cerebral cortex and when dosage of these genes is diminished, numbers, migration and connectivity of neurons and circuits essential for normal behavior may be disrupted. The most replicated finding in the last decade is that increased autism risk is associated with advancing parental age. The genetic architecture in the parents does not change over time, why then is increased autism risk associated with advancing parental age?